Festive Attyre: the anticlimactic ta-da! 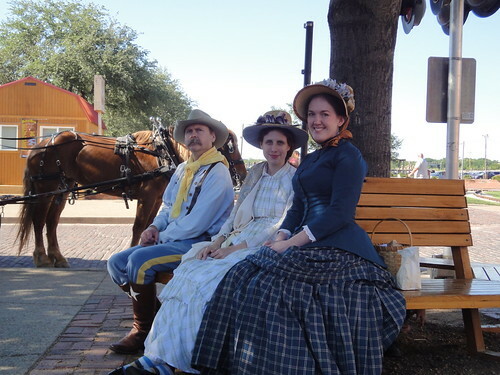 So I finished my 1883 dress last weekend and had a great time at the train event. Unfortunately, I was so insanely exhausted from it all that I didn't have the energy to do a blog post about finishing my dress right away, and then a week slipped by before I knew it, and now I'm already knee deep into my next costume plans. Whoops. So this seems pretty anticlimactic at this point, but I just wanted to post a quick note to say that I finished the dress and I'm quite happy with the way it all turned out. 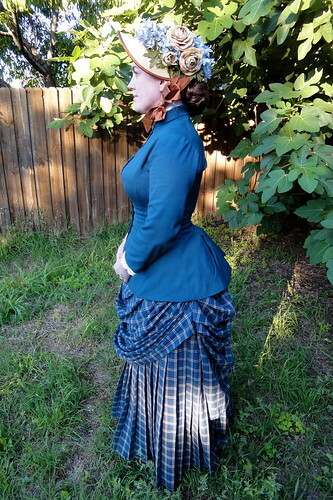 I've been wanting an "everyday" Victorian bustle dress for years now, and I am thrilled that this one fits the bill so well. 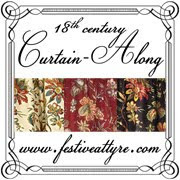 It will be great for wearing to living history events. I'm out of space on my website, so I'll have to go in and do some housecleaning before I can post an official page about it. But until then, you can see more pictures of my dress and the event on flickr. I like the group shot better--you look happy, and your position and pose shows off the dress so well! Beautiful job. your waist looks so tiny in that outfit, it's so flattering on you! Jen that came out perfect and you look wonderful. The hat is to die for, I'm in love with your hat! Beyond gorgeous! And what a wonderful hourglass figure you've got!